This is the beach-front locale where the professionals set up their cameras*. We should have walked down to the beach, but I was so cold, I stayed indoors at the dining hall while waiting for the show to start. I only went outside to the balcony about 10 minutes before the show started. The second story balcony had a slightly better view than the top photo, but some of the fireworks from the bridge itself and from Pier 39 were obscured by foliage. We had a great view of the fireworks from Crissy Field, the main launch site. We didn't know about the fireworks off the bridge. We'll have to wait another 25 years to see that. Mark says that we have a date for the 100th Anniversary of the Golden Gate bridge. Next time, we will walk down to the waterfront for optimal views. Remind me to wear long underwear and a hat. We had a good chuckle while reminiscing about the 50th. I went to the 50th celebration with the guy I was dating at the time. (He has his own Wikipedia entry and an ego to match.) Unfortunately, the event planners under-predicted the number of people who would be interested in walking across the bridge. They didn't set up traffic lanes so people started from both the north (Sausalito) and south (San Francisco) sides, taking up all lanes. When they met in the middle, there was gridlock. No one could get on or off. It was a fiasco. So many people piled onto the bridge that the bridge flattened (lost it's parabolic shape). Fortunately, the bridge did not collapse under the load and disaster was averted. My date and I didn't get a super early start so we never got on the bridge. We were stuck on the staircase leading up to the bridge from the SF side. In retrospect, that was a lucky break. I went to work the following Monday and told the lab mate who would become Bad Dad about the day. He was impressed by how I spent my free time. Funny, I thought the same about him. We used to laugh as we our dating war stories. Bad Dad credits the other guy for making him seem like such a good catch. We don't have the camera or know-how to take great photos. But I highly recommend the Mercury News slideshow. Stargazer made a schematic showing the fireworks setup and prime viewing angles. We were on the northern Sausalito side. * Notice the new glasses and the sticker from the deYoung Museum, where we saw the Gaultier exhibit. It was fantastic. Go see it if you can! I have not mastered how to take photos of fireworks. And it is too late at night to think about uploading our daytime photos of today's celebrations for the 75th anniversary of the opening of the Golden Gate Bridge. But, don't miss this slideshow at the San Jose Mercury News. 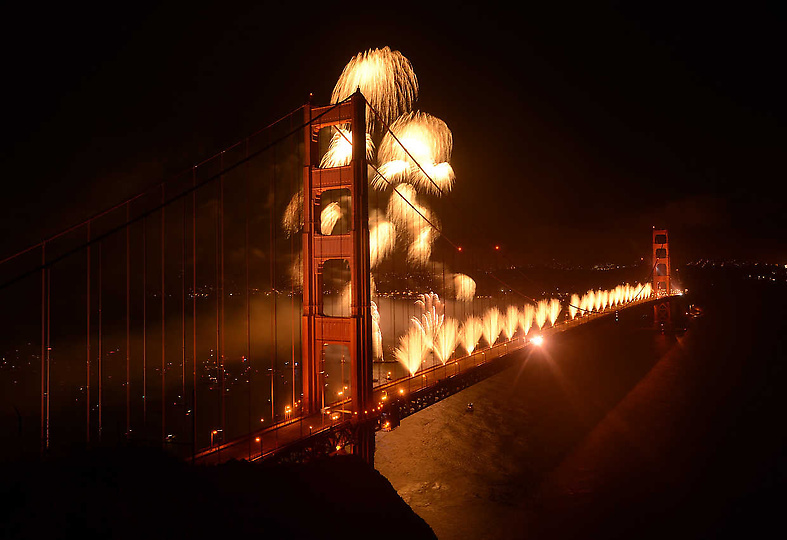 There were simultaneous fireworks from Crissy Field, off the bridge towers and a curtain of fire spilling off the sides of the bridge. Simply spectacular. 25 years ago, I tried to walk on the bridge but was stopped by the gridlock while on the staircase just below the bridge. There's a fun story about the day that the Golden Gate Bridge flattened. It was the heaviest load the bridge ever held, and there were no cars! Last month, Iris and I attended an author panel at the LA Times Festival of Books called, The Nerds Shall Inherit the Earth. It actually wasn't our first choice, but we could get tickets for it while the other one was booked solid. I'm so glad we went. I was expecting a rant along the lines of David Anderegg's Nerds: Who They Are and Why We Need More of Them. He had such a big chip on his shoulder about nerd-dom and I was not in the mood for a self-pity party. Imagine the pleasant surprise of spending time with three thoughtful and opinionated authors (Maureen Johnson, John Scalzi, Pamela Ribon) celebrating nerd-dom instead. John Scalzi started the ball rolling by describing the difference between a hipster and a nerd. A hipster needs to assert his/her superior taste over the masses. S/he must find the next new thing before it is discovered and "ruined" by others. A nerd, on the other hand, is interested in bonding over shared taste. A true nerd is thrilled to discover that someone else shares their thing. "Ooh, I love it too! Let's throw a (fill in the theme) party to celebrate it! If that's not your thing, that's OK. I'm sure we can find something else we like in common." He added that nerds owe a debt to the Gay Lesbian Bisexual (GLB) community, which made it socially acceptable to be unapologetic about not being mainstream. Maureen Johnson piped in with the insight that, to be a nerd is to abandon fear of rejection. They hit the nail right on the head. For years, I've been bothered by the "hip" and "modern" labels used to describe motherhood or traditionally female arts done by young women proclaiming that "this isn't your grandmother's knitting". Hip is an assertion of knowing more than the rest--the unhip. "Hip and modern" is a denial of the wisdom and experience of those that came before us. In my experience, motherhood is a journey into uncharted waters, where the outcome is uncertain. To proclaim hipdom--that one knows better than predecessors--is the height of hubris. So let's bury hip-dom and celebrate nerdliness. For example, check out how I clean finish the inside edges of Iris' and my shirts at the top. It's all done with nothing more than a straight stitch--the kind of finish that your grandmother might have used. It works, is durable, and feels much better next to the skin than today's serged seam finishes. Or check out how I sewed smooth and even curves for the scalloped neckline on Iris' top*. I want to be a nerd in the sense that I want to educate/convert others to share my skills and enthusiasms. *Then check out this tutorial for how to turn the curve so that it remains smooth. It's different than methods I've seen elsewhere on the internet and in books. The difference is that this method actually works! PS. If you really want to geek out with a nerd, check out my sister's fiber arts blog. She knits, she spins, she weaves, she dyes. If you don't know the difference between a Z-twist and an S-twist, but want to learn, it's a great place to start. I read with sadness about the passing of Carlos Fuentes. When I was in grad school, he gave a talk on campus in which he said something along the lines of, "When scientists invent a machine for time travel, they will have caught up with writers." He further elaborated that literature need not follow a linear time line. A story can sometimes be more effectively told with time looping back upon itself. Even though I .still. haven't read any of his novels yet, his observation about time stuck with me through the years. This week, I read Graham Swift's fantastic new novel, Wish You Were Here. Nonlinear time is a hallmark of Swift's work. Time runs every which way, much like water in the (below sea level) Fenland setting of his tour de force, Waterland. I found the crazy turn of events at the end of Wish You Were Here confounding, until I realized that Swift had telegraphed it right there on page 57. I major part of my enjoyment of unemployment stems from the fact that I now have time to read. There have been a string of winners, too. Wish You Were Here. The Sense of an Ending. The Hunger Games trilogy. What are you reading? Leave a comment. If you are also on Goodreads, friend me and share your recommendations. I seldom stand up after a performance (except to leave). But our entire family gave a standing ovation to Follies tonight. Sometimes, it takes fiction to teach us truth. There was a war going on, that was the story. Though who would know, or want to know, down here at Sands End? A war on terror, that was the general story. Jack knew that terror was a thing you felt inside, so what could a war on terror be, in the end, but a war against yourself? page 57 Wish You Were Here by Graham Swift.